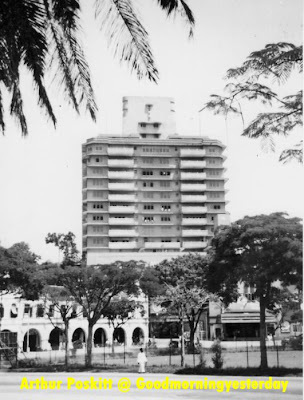 In my previous post, I showed you several views of the Cathay Building in 1947 or thereabouts. Below at two more photos. This was sent to me by Peter after reading my article. These are his comments (in blue). This was taken in June 1946 from an RAF aircraft. Cathay Building is viewed from Kirk Terrace. There is Amber Mansions and parts of Clemenceau Avenue in the background. 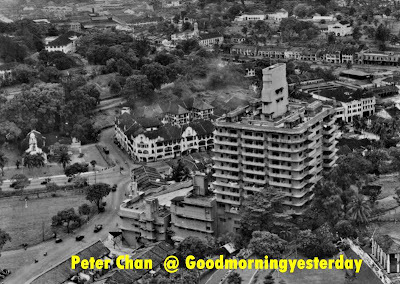 Notice that the site where the Supreme House (now called Park Mall) along Penang Road is empty land. From what I read in my grandfather's notes, the British Army requisitioned all the warehouses/godowns around Pulau Saigon, Mohd Sultan Road, Roberston Quay for their logistic base after the recapture of Singapore from the Japanese, The tongkangs will sail up the Singapore River after collecting all the military cargo from Keppel Harbour. Later the British Army decided to build their own base instead of renting from the Chinese merchants. This new place was called Alexandra Camp which is now Dawson Estate and Prince Philip Avenue. Talking about the Amber House, I recall an experience there in the 50’s. My father brought me to visit a dentist at a unit facing the Orchard Presbyterian Church. I remember the building being very ‘solid’ and having green colour stained glass windows. The name of the dentist was Dr Woon (or maybe Oon). Anyway, I was so terrified that I absolutely refused to let the dentist remove a rotten tooth. Thank God, my teeth today are still in good condition. And my children have no fear at all of the dentist. Here’s a quiz for you. This photo shows the Cathay Building in the distant background. It was from the George Shaw collection sent to me by Russ Wickson. Next to the photo were scribbled some words. I will reveal them later. First, can you identity the ‘nissen hut’ building and the street shown in the foreground? 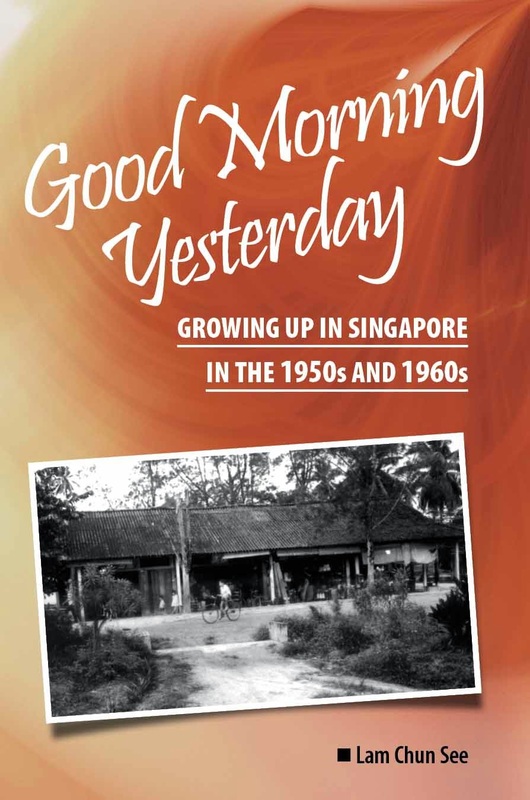 Which was the tallest building in Singapore in 1947? Without even checking the history books, I daresay, it was the Cathay Building. Looking at the old photos taken by Arthur Poskitt and George Shaw in and around 1947, I saw several of this grand old dame. According to its official website, up to 1955, pilots flying into Kallang Airport often used the 79.5 metre-high Cathay Building as a landmark for their final approach. It was also Singapore’s first air-conditioned theatre. Below are three photos taken by Arthur Poskitt in 1947. Descriptions by Peter Chan. Photo no.3 - Viewed from YMCA now SMU campus. Below are two photos taken by George Shaw. The year was around 1946 to 1948. Descriptions by George Shaw. 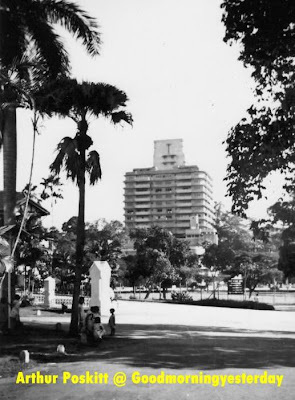 “Cathay” – HQ of Nippon War Staff. HQ of British (SACSEA) … anyone know what is SACSEA? Below are two photos taken by Lam Chun See in April 2010. Recently, during the Chinese New Year period, I joined my ex-colleagues from NPB for a ‘lo-hei’ dinner at the Cathay Restaurant. I was truly amazed at how much Cathay has been transformed. It is now an ultra-modern shopping complex with lots of young shoppers. The restaurant itself is much smaller than in 1986 when I attended my younger brother’s wedding dinner. As for the movies, I can only recall two, Chariots of Fire and Pete’s Dragon. And of course there was the memorable Kodak advertisement with Paul Anka singing Times of Your Life. My grandfather never stopped his hobby until the day he passed on. Just before that he summoned my cousin and I to his bedside; being the senior male descendants of the family clan, he told us of his parting wish. Being the elder of the two, my cousin made his choice of a colourful world atlas and I was left with his other collection. I was devastated because I was eyeing the world atlas book. What was the man thinking then? Since then I have kept this pristine collection in some dark corner for the last 40 years. 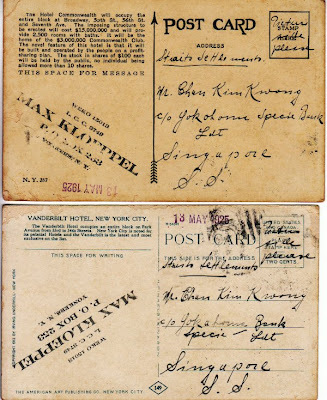 When I now closely scrutinized the postcards several questions came to my mind, some I had answers but many we don’t. 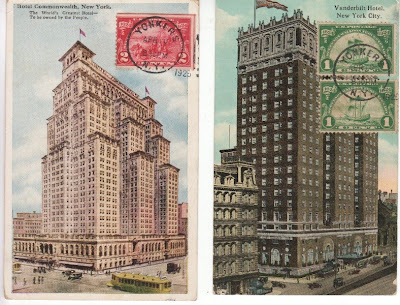 Photo 2: The reverse of a post card (c 1925). 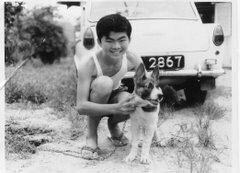 The Yokohama-Specie Bank has a place in Singapore’s history. 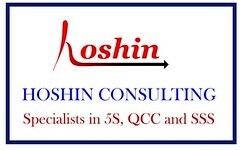 It was the Japanese bank which arranged the S$50 million Chinese community contribution to Japan’s WW2 efforts. After Japan lost the war in 1945, Japanese assets were seized. Today HSBC occupies the same spot where this Japanese bank once stood. Yokohama Specie Bank is now Bank of Tokyo-Mitsubishi UFJ. For example, how did my grandfather see the world 85 years ago? How did he find so many Caucasian pen-pals willing to correspond with a Chinese man from Singapore? 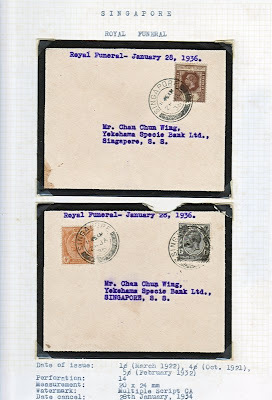 I discovered he used a moniker “Chan Kim Kwong” and the corresponding address of his office (Yokohama Specie Bank) and the family home (12 Pasar Lane in Jalan Besar). What is even stranger if you examine the hand-writing of postcards received from Europe and the Americas? I am certain it was my grandfather’s hand-writing but how did he get franked postcards of so many countries? Later my grandfather turned to a typewriter instead of handwriting. He gave up collecting postcards and found a new direction; covers. My grandfather’s collection of postcards and covers has become a fascinating subject for me, though I beg to differ that I am a stamp collector. There is so much interesting information I can gather because he has left me with so many written commentaries. Come think of what a stupid thing I could have done if I had decided to offer it to the “Kalang Guni Man”. Today travel to foreign countries is so easy and made even cheaper by the introduction of budget airlines. With the Internet we can even see foreign countries through pictures. Nearly 90 years ago, my grandfather also saw the world but he did it very differently, not like the way I envisaged. He did not join the merchant navy and jump-ship. I was very amazed at the way how he did it. He did something unique in the age of steamships, tongkangs and pig-tails. I am still putting the pieces together on how he managed and balanced leisure against a career given that he was the sole breadwinner and supporting a family of 12. From bits of references here and there, I gathered he loved to collect stamps, envelopes, postcards, coins, newspaper clippings and smoking pipes. But he was never a sportsman. 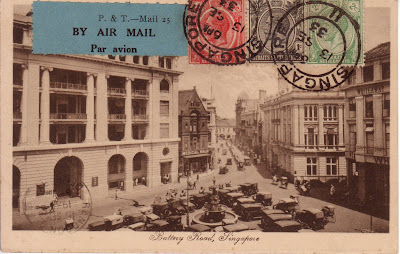 As I unraveled more intimate details of my grandfather, I shall start with his collection of postcards of Singapore’s commercial center. This part of Singapore was where he began his career at the age of 17 in 1918. So presumably this part of Singapore must have interested him similar to what caught my interest as a child in the early 60s. Do you recognize anything from the postcards? Photo 2: Raffles Place. The 3 storey building in the center of the photo was the British bank, the Mercantile Bank between D’Almeida Street and D’Souza Street. Robinson’s was on the right. 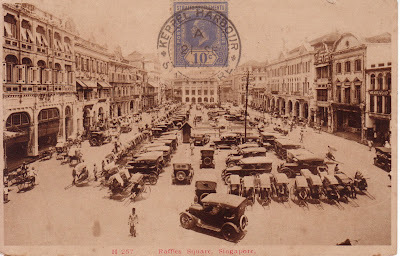 The car park is now Raffles MRT Station (circa 1933). 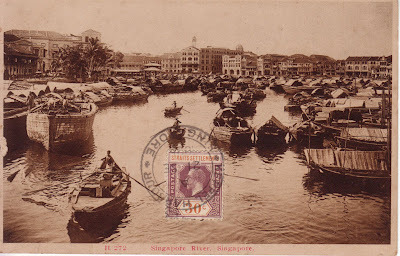 Photo 3: Singapore River where Chinese business blended with colonial interests (circa 1925). 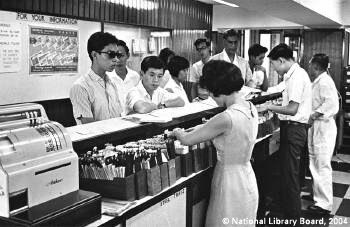 Can you remember the procedure for borrowing books at the old National Library? 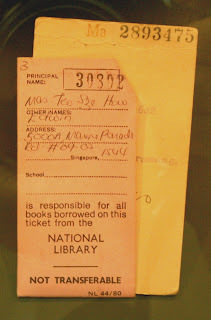 When I last visited the National Library at Victoria Street, I saw some exhibits of the old library cards. I am trying to recall the system for borrowing and returning books. Hope older readers can confirm if I remember correctly. 1) Each registered member is given a number of library cards like the one in the photo above. 2) When you want to borrow a book, the librarian will take out the card from a pocket mounted on the back cover of the book and slot in your membership card and place it in a wooden box with the cards arranged in alphabetical order. 3) She will stamp the due date on the Due Date slip pasted on the back cover of the book. 4) When you return the book, she would look for your card and take out the book card, slot it back into the pocket in the back of the book and return your card to you. Recently, I received an email from an architectural student asking me if I could recall what used be on the grassy patch of land at the junction of Armenian Street and Stamford Road. See photo below; and here’s my reply. I wonder if older readers can confirm if I remember correctly. Below is a map of from my 1981 street directory for reference. "If my memory serves me, it used to be a sort of make-shift, single storey open coffee shop; i.e. without walls. Stalls may be a better word. So as the bus rounded the bend from Armenian Street and turns left into Stamford Rd, immediately there is bus stop. This coffee shop is directly behind the bus stop. Immediately after the bus stop is the entrance (for cars) to the Nat Lib. Further down is the exit, and after that is the National Museum. Behind this coffee shop would be an open car park. I think part of it is still there. Many users of the library would take their meals here. Across the road at Waterloo Street were several very famous Indian sarabak stalls selling Indian Rojak and Mee Rebus. When we want to get to the library, we take a bus and alight at Bras Basah Rd and walk along Waterloo Street. We were bound to be accosted by the hawkers. What I remember most about the coffee shop at the Library was the ice kacang. They had these jars of multi-colour syrup and there were always some bees hovering around them. Even when you were not going to the library, the bus always stopped at this bus stop and if you were sitting in the aisle seat, you could see these syrup and bees. What are my thoughts when I pass this place? The green patch itself - not much except for the bees and syrup. My other thought is; "No life". But this area as a whole; especially the tunnel entrance make me fell a sense of resentment that the government refused to listen to the people and insisted on destroying something so dear to our memories of our childhood; in spite of strong objections from many people." I remember our PM saying at one of his National Rally speeches that the government wanted to redevelop this area into a ‘hip’ and happening place where young people can hangout etc. etc. But when I see this place now, it looks so deserted and lifeless. During our time, it was truly full of life. Even the MPH building was always crowded with students and young people. One more question for the oldies. According to my 1981 street directory, there was CPIB (Corrupt Practices Investigation Bureau) building next to the library. I don’t have any recollections of this building. I always thought the CPIB building was at Cantonment Road?